Throughout the years, the January transfer window is known for being used for backups for several football clubs in Europe. 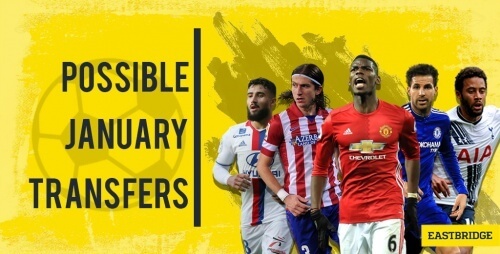 There have been a lot of rumours going around in the football scene ever since the summer transfer window ended, and with the January transfer window just less than a month away, there are quite a number of players that are speculated to transfer from their respective clubs after the turn of the year. Here are some of the players rumoured to make a move in the winter transfer window. 1. Filipe Luis’ glory days has been cut short as Atletico Madrid’s regular left-back ever since the advent of Lucas Hernandez after his stellar performance in the 2018 FIFA World Cup. Since then, Hernandez proved to be a more agile and creative left-back than Luis which compelled Atletico boos Diego Simeone to keep him sidelined for most of their fixtures. Several clubs such as Paris Saint-Germain and Arsenal are reportedly interested in signing Luis. 2. Cesc Fabregas has struggled to get into Chelsea’s lineup ever since the appointment of Maurizio Sarri since the new boss doesn’t really include him as part of his key system. Fabregas suffered a knee injury early in the season which hindered the start of his campaign. He has only one appearance as substitute for Chelsea this season. Fabregas has been rumoured to transfer to Valencia during the winter transfer window. 3. Mousa Dembele has already established himself as one of Tottenham Hotspur’s key players over the years. However, the future of central midfielder of the Spurs is currently masked in uncertainty. With his contract due to end next summer, Dembele was rumoured to transfer to China during the last transfer window but decided to stay put. As of now, both Juventus and Inter are reported to be interested in the midfielder. 4. Nabil Fekir has been playing remarkably well for Olympique Lyonnais but hasn’t signed a new contract with the French outfit yet. It is speculated that the winger has been thinking about a move to Premier League side Liverpool. Fekir was actually thinking of moving to Liverpool earlies this year but the deal didn’t push through because of the player’s medical. He then went on to play in the World Cup before committing another year at the Ligue 1 side. It is also reported that Chelsea is interested in signing the Frenchman. 5. Paul Pogba signed with Manchester United from Juventus in 2016 but he has been inconsistent throughout his spell at Man Utd and has attracted more attentions for his relationship with United boss Jose Mourinho than his impressive performances on the field. Earlier in the season, he was linked with Barcelona and Juventus and that rumours returned just as the January transfer window approaches. Recently, Juventus confirmed their interest in taking Pogba back from United. Are your favourite players among those who are listed here? Stay tuned to Eastbridge bet broker to catch the latest updates on your favourite players, teams, and leagues. You can also place your bets on them by checking out the best odds and prices in our partner sports trading platform.